I'm a big fan of technology...when it makes life easier — especially in the courtroom or some other aspect of advocacy. I bought an iPad with a pretty good idea of what it can and can't do, and in the month I've had it, I've found it to be a fantastic tool for use at Court. It's a great way to access email and the internet, and the fact that it's always on and small enough to carry in my hand like a notepad makes it more convenient that using a laptop for that. The calendar on the iPad is a big improvement on the iPhone calendar, and makes it easy to instantly see what's in my schedule. And with applications like PressReader, I can carry several newspapers with me, along with podcasts from the Law Report. The other great use is to reduce the amount of paper but increase the amount of information I can take with me. I scan my briefs to PDF, OCR and bookmark them, and then load them on the iPad. I sure appreciated that on the weekend when I took home a 400-page brief in digital form rather than hard-copy! And the ability to carry acts and cases is great. And if something pops up at Court, I can search for and download a lot of what I might need! 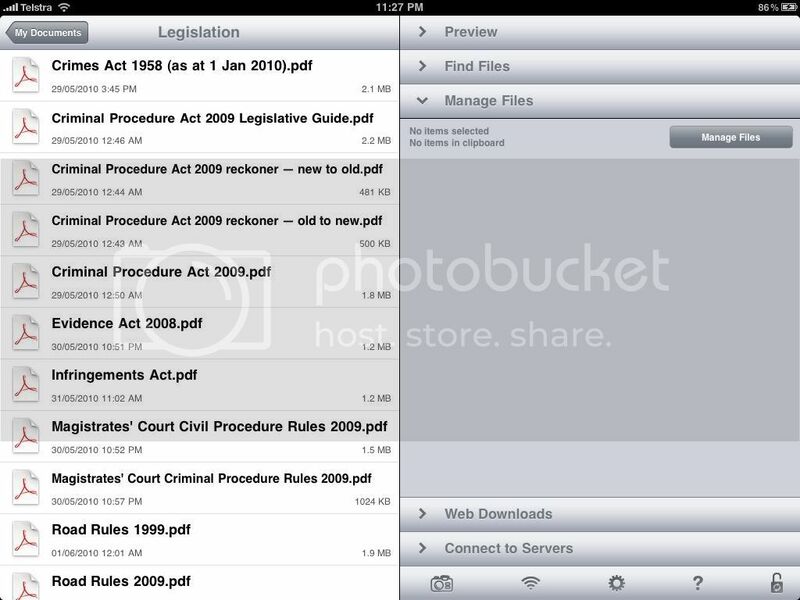 There are a few applications available on the iPad for viewing PDFs. The best ones are iAnnotate or GoodReader. iAnnotate allows annotations on the iPad, but — as far as I know — they don't sync back to the file on your computer. Have a look at this blog post from the prosecutor's office in Wise County Virginia, to get an idea of how to use iAnnotate. Right now, GoodReader doesn't provide for annotations to PDFs on the iPad — like highlighting text or notes in the margins — but I emailed the developers and they say bi-directional annotation support is coming soon. I look forward to that, because right now any annotations I make in Adobe Acrobat aren't visible on the file on the iPad. This is what GoodReader looks like on the iPad. Combined with DropBox — a must-have utility — this gives me access to all my files, and the ability to download them on to the iPad. When I open a file — say, the Criminal Procedure Act 2009 — I get exactly the same as the printed copy, but without the bulk. Yes, there are times when hardcopy is more useful. For example, I'd take my hardcopy Road Safety Act to a contested hearing. But I can't physically carry 20 different hard-copy acts and regulations on every occasion I go to court, unlike the electronic versions on the iPad. 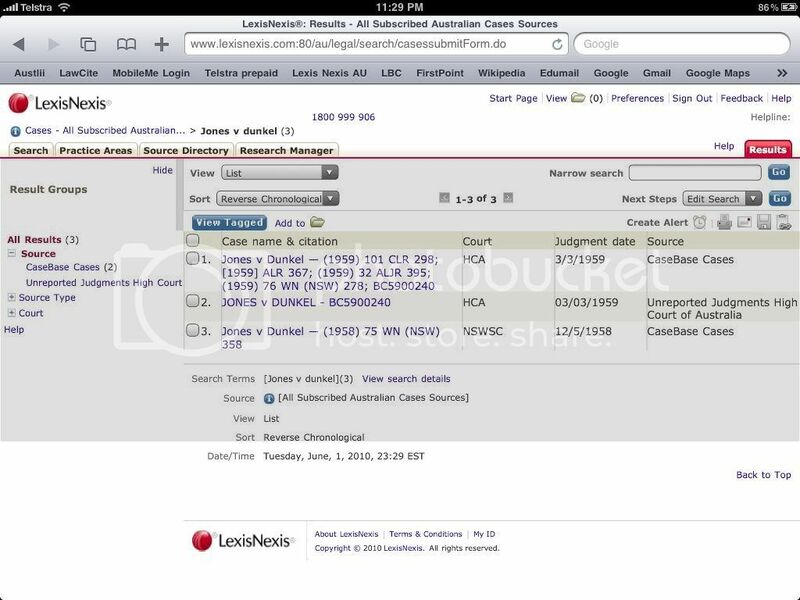 I can access LexisNexisAU on the iPad's browser, Safari. 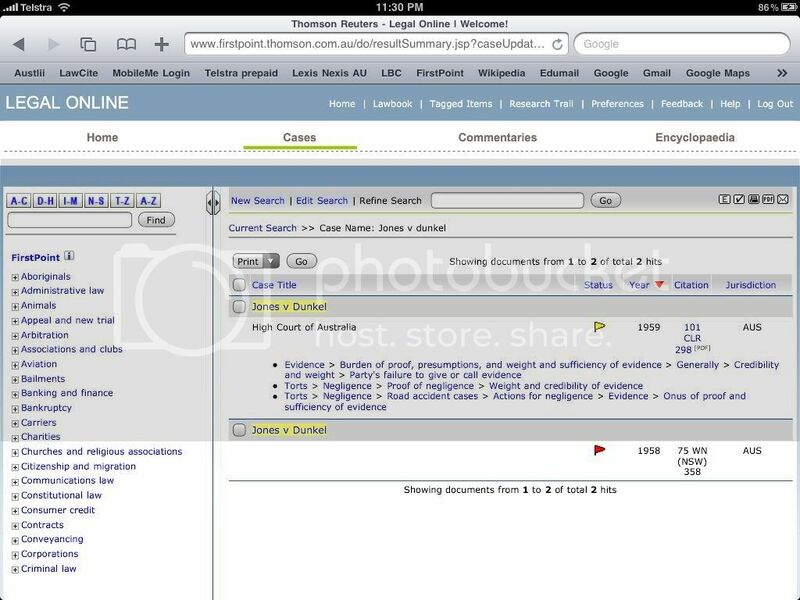 I think LexisNexis uses flash to drive its website...and the iPad can't use flash. 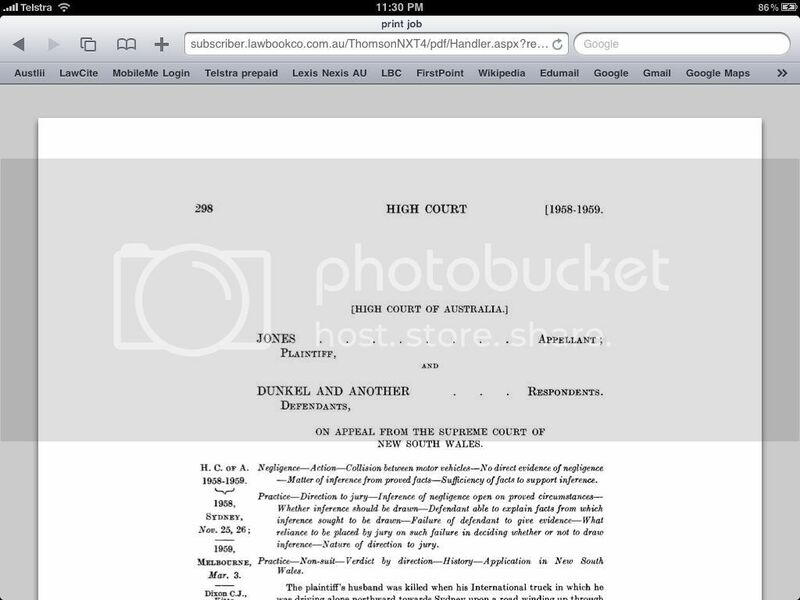 So, downloading PDF versions of cases from LexisNexisAU doesn't work on the iPad. Best I can get it to do is to display the first page. Thompson LawBook on the other hand works really well with the iPad. There's no find function on Safari on the iPad (CTRL + F on a PC or ⌘ + F on a Mac), so I use FindStuff to search for a word in a webpage. Or, you might want to try Find in a page, though it's case-sensitive which sometimes restricts its utility. 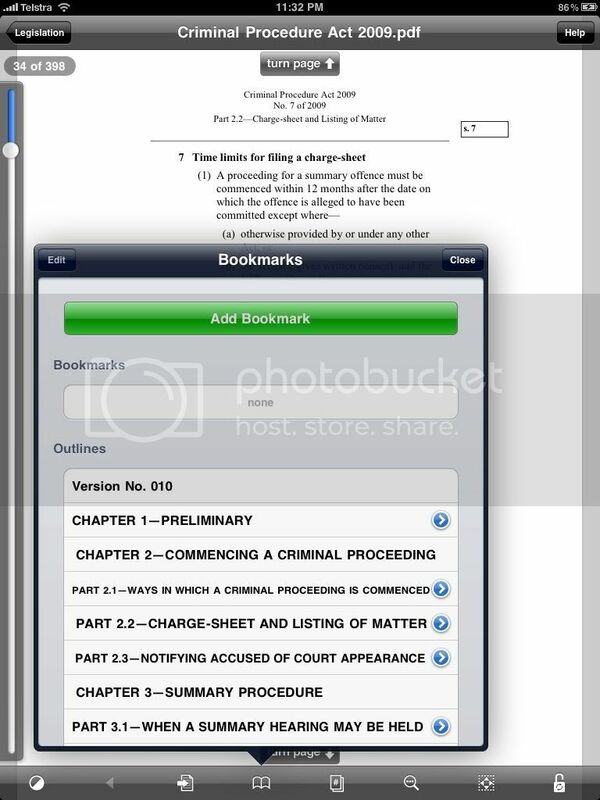 And PDF copies of cases download quite nicely on the iPad. All I need to do is to insert a G at the start of the URL, and the PDF will download into GoodReader, available for viewing at any time — even if I'm off-line. Navigation on big documents really requires bookmarks. When they're available — like in Victorian legislation — it's easy to drill down through Chapters, Parts, Divisions, sub-divisions, and sections. Sadly, the publishers of Commonwealth legislation don't put this in their PDF versions of legislation. (I suspect it's to do with the styles they use in their documents and their conversion settings.) 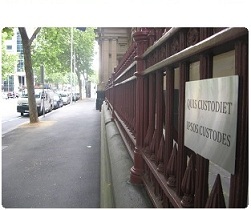 Until they match the great work of Victoria's Parliamentary Counsel, the only solution is to manually add bookmarks. I find that easier on a computer using Adobe Acrobat. Though it can be done in GoodReader on the iPad, it's tedious to say the least on something as big as the Commonwealth Criminal Code! The iPad isn't a complete replacement for a laptop at Court though. I can use QuickOffice to view and edit MS Office docs, but I still use NoteBook for notes and outlines and TimeLine3D on my laptop. My own view is that the iPad is great for content consumption, but not as good for content creation. But it's pretty good for what I want it for. I've already had one occasion when I downloaded legislation in the courtroom, anticipating a query from the Bench, and then handed up the iPad to allow the magistrate to read the legislation! 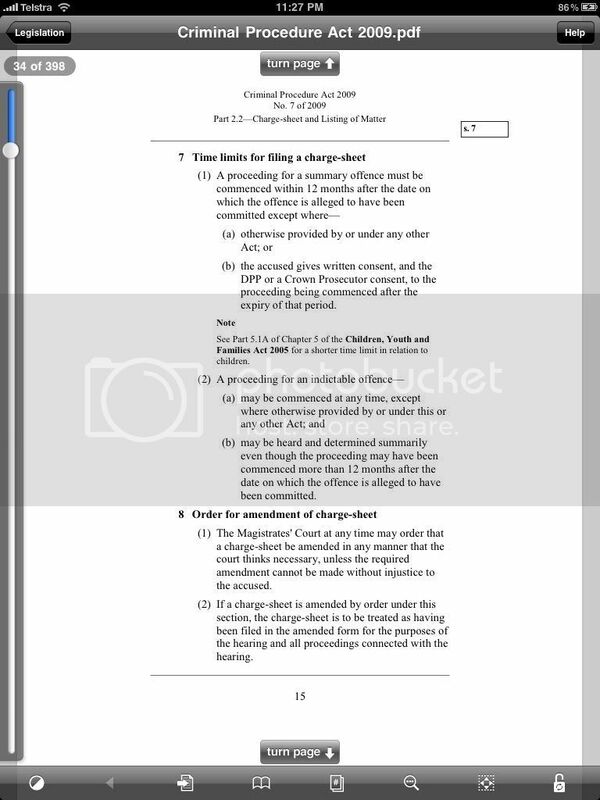 And I don't think that will be novel for very long: last week I was told that magistrates' have been provided with an iPad as part of their book allowance. I don't know if that is accurate, and if it means they all get one automatically, or can choose to get one if they want. But keep your eyes peeled for some iPad spotting! One firm of solicitors liked the idea so much that all their advocates have been issued with them.